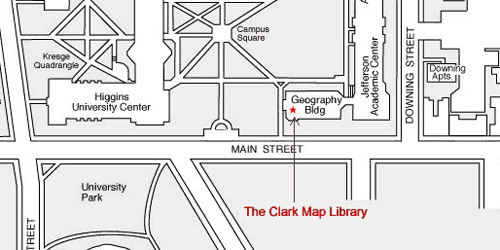 The Library is located on the lower level of the Geography Building, marked in red on the map below. Enter the building by the door located directly across from the University Center. Proceed straight ahead, through a second set of doors, the large room with the high ceilings, and a third set of doors. Immediately after exiting the last set of doors, take the staircase on the left down to the basement. From the south, east and west: Follow Route 90 (Mass Pike) toward Worcester. Take Exit 10-Route 290 East. Once on Route 290 East, take Exit 11 (College Square/Federal Square) off 290. Go straight, following sign for Federal Square/Downtown. At second traffic light take a left onto Cambridge Street (St. Matthew's Church on left and Culpeppers Bakery on right). Go one mile to the end of Cambridge Street. Take a sharp right onto Main Street. Go to the first traffic light at Maywood Street. Take a left onto Maywood and another left into the parking lot. The Clark campus is opposite this parking lot. From the north: Traveling on Route 290 West, take Exit 11 (College Square/Federal Square) off 290. Go straight, following sign for Federal Square/Downtown. At second traffic light take a left onto Cambridge Street (St. Matthew's Church on left and Culpeppers Bakery on right). Go one mile to the end of Cambridge Street. Take a sharp right onto Main Street. Go to the first traffic light at Maywood Street. Take a left onto Maywood and another left into the parking lot. Admissions is the blue building on the corner of Main and Maywood. The Clark campus is opposite this parking lot.